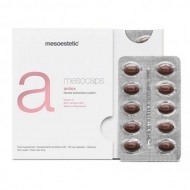 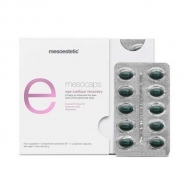 DESCRIPTION: Mesocaps Age Repair from Mesostetic are capsules for people with photographic signs and premature schedules, wrinkles, sagging or lack of light, as well as people who undergo ablative treatments. 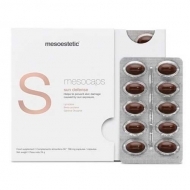 It is designed to prevent aging in all its states. 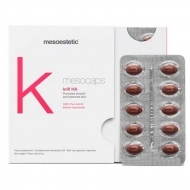 The combination of water-soluble and water-soluble vitamins responsible for preventing premature aging, along with active antioxidants and repair shops, give it the property of contributing to an improvement in energy metabolism as well as to fight against oxidative damage, to avoid the appearance of wrinkles and signs of sagging. 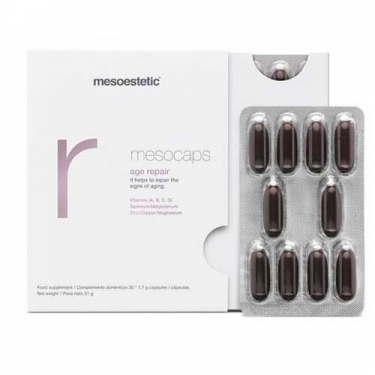 Mesocapso's age repair is the most complete nutritional product on the anti-aging market in the formulation of repairs.